Unforgettable: The Bold Flavors of Paula Wolfert's Renegade Life by Emily Kaiser Thelin, a biography of famed chef and cookbook author Paula Wolfert, includes some of Wolfert's famously detailed recipes. A new biography of famed chef and cookbook author Paula Wolfert was recently published, featuring — you guessed it — some of her delicious recipes. Wolfert has been called the Julia Child of Mediterranean food in America. She once spoke eight languages and could tell how a piece of bread was leavened with one bite. Thanks to her detailed writing, top chefs in the U.S. say she taught them to treasure flavors from the Mediterranean. But a few years ago, Wolfert was diagnosed with dementia. 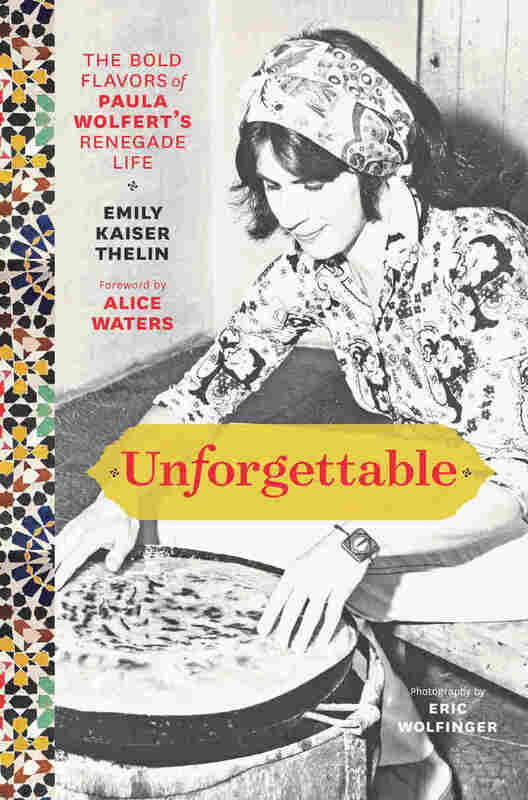 That's when Emily Kaiser Thelin set out to capture Wolfert's memories and recipes while she still could, and published them in Unforgettable: The Bold Flavors of Paula Wolfert's Renegade Life. She was Wolfert's editor and has now become her biographer. Thelin tells NPR's Linda Wertheimer that it wasn't easy getting her book published. "About a dozen publishers told me her time passed but I felt her accomplishments were too important to not have a book," Thelin says. "So with the support of the photographer on the book Eric Wolfinger, he suggested we just publish it ourselves and use Kickstarter to raise the money — which allowed us to publish it." She was diagnosed with dementia in January of 2013, but that is a big part of what motivated us to act. We saw the opportunity to cook with her was another way to research her experiences and her stories, to see what memories these recipes might evoke. One of the first symptoms of Alzheimer and many types of dementia is it takes away your sense of smoke, which is incredibly important as a food safety measure as a cook. So we very quickly took her away from the stoves, but she could still sit there and watch us cook. We also would have her do certain, very easy prep steps like this incredible eggplant relish that her grandmother taught her, which involves squeezing the eggplants between her hands. And that was an incredible moment because while was she was standing there talking to me and saying: "I don't remember anything about this dish," but clearly her hands showed an incredible familiarity with the prep steps. Her cookbooks assume a high degree of cooking experience. Her biggest audience were professional chefs and she basically wrote her books for them. I wanted to let anybody cook these. Obviously couscous is one of the most difficult recipes in the book. We chose most of her most accessible recipes so that you could discover the wonderful flavors of pomegranate molasses or sumac. We wanted everyone to be able to enjoy the incredible layered and truly unforgettable flavors of the best of her recipes. The cracked green olive relish, which is from southeastern Turkey, is a terrific palate cleanser and uses wonderful fall foods like pomegranate seeds. You just have to be careful making it because you'll never want to stop making it. This incredible recipe is from Ayfer Unsal, an acclaimed Turkish food journalist and gifted cook from Gaziantep and one of Paula's closest friends. It combines ingredients you would never expect to go together in such perfect balance: cracked green olives, crunchy walnuts, tangy pomegranate seeds, and zingy lemon juice. It is a lovely accompaniment to grilled fish or meat (such as pork skewers, page 209), Oven-Steamed Salmon (page 253), or melon. Copyright 2017 by Emily Kaiser Thelin. Reprinted with permission from Grand Central Life & Style. Thelin's book Unforgettable is on sale now.